Hello, dearest Reader. I feel like I’ve fallen far off the grid, and yet it’s only been a week and several hours since my last post. The real difference is I haven’t visited any of my friends’ blogs. I’ve been busy, which is quite fitting since today is Labor Day in the US. Knitting is much like writing for me. I love the process. I love seeing the pattern unfold through my fingers as much as I enjoy seeing a story take shape on a page. I love the feel of soft wool against my skin as much as I love the intimacy I develop with my characters. But I don’t love having to put the pieces together as much as I don’t love having to revise and rewrite. The problem is self-doubt. Whenever I knit for someone else, I’m more critical of my work than when knitting for myself. I will rip out a finished sleeve and start over if I find a mistake. Even when I’m convinced I’ve done the best I could, I still find “defects” in my knitting: a slight gap where I twisted a stitch one way instead of the other; a telltale seam along the back of the hat. It’s the same when I think of other people reading my writing: Melissa’s breakdown is too melodramatic; the setting too vague, too Anywhere, USA. Typos and grammar can be fixed by an editor. Poor revision cannot (well, not unless I’m willing to spend $$$$$$$$$$). Shortly, things will be even busier. I’ve managed to register for two free online courses: (1) Modern & Contemporary American Poetry offered by the University of Pennsylvania; and (2) How Writers Write Fiction with the University of Iowa, the same folks who offered the poetry course I took a few months ago. The poetry course will start on Sept 12 and the fiction course on Sept 24. And I still have my day job. Am I insane? Is there a padded cell in my near future? I keep taking things to the limit. Cue The Eagles. 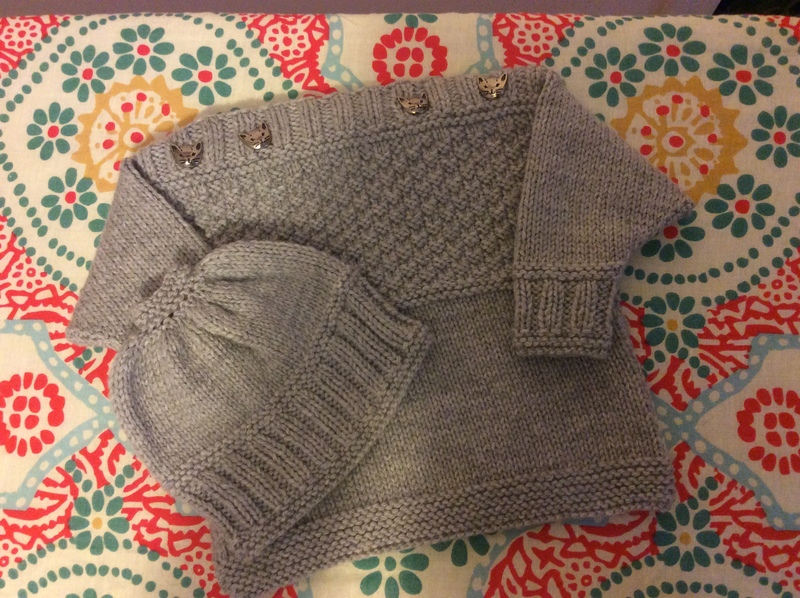 This entry was posted in Knitting and tagged angst, baby blanket, Basic knitted fabrics, Blanket, fiction, knitting, knitting for infants, poetry, Stitch (textile arts), writing, writing like knitting. Bookmark the permalink. Definitely sounds like writing. I think the sweater and cap look really good. Thanks, Charles! Good luck with your Labor Day sale! Thanks. It’s not the only big event though. Have something major getting announced in an hour. What a sweet sweater and cap, Marie! I could never do that…I’m impressed. I can barely sew a button. Great song! I hope you had a fantastic holiday! Thanks, Jill! Hope you had a great weekend as well! No, you are not insane. I think you love to push yourself to the limit. Oh, wait….the song. Marie, what a beautiful set. Truly, it’s just lovely. What fine, delicate work! By the way, thanks for your support of the 30/30 Project. It will bring more poetry forth into the world!!!! Ooh, I like the idea of crocheting a flower there…that could work. I’ll have to see what it looks like when it’s all done but thanks for the great tip. Ah!!!! So adorable! They look great, Marie!!! Like you, I see my writing in the same way as I do with knitting or crocheting. It’s great to see how the written pattern unfolds in a beautiful sweater. Marie, you are a perfectionist like I am! You don’t some up on my reader. How do I “follow” you again?